the Huon River, Port Esperance and D'Entrecasteaux Channel, and Tasman Peninsula areas.While overseas export, particularly to Japan, Hong Kong and Singapore is important, more than 90% of the salmon produced in Tasmania is eaten in Australia. The broodstock (parent fish) are moved from a seawater farm to the hatchery. The broodstock start to spawn. Eggs are collected, fertilised and laid out in special incubator trays in the hatchery building. The eggs are supplied with a constant flow of fresh, warmed, filtered, well oxygenated water. The eggs start hatching with the young fish feeding from the large yolk-sac attached to their bodies. When they are ready to eat for the first time, they are moved into small tanks and provided with a specially prepared food, broken up into particles which are small enough for the fish to eat. The feed contains a balanced package of all of the nutrients the fish need, consisting mainly of fish meal, vegetable matter, added vitamins and minerals. When the young fish become too big for the hatchery tanks, they are moved to large tanks, where they spend 8-16 months before being transferred to sea. The salmon use more oxygen than the river can provide, which means that oxygen needs to be bubbled into the water. When the fish are about 15 months old and weigh about 70g they are known as smolts. 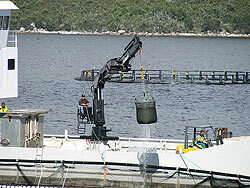 These are transferred to the sea using pumps to load the fish into tanks of water on trucks. Once transferred from the hatchery, the fish are either stored in fish cages at "nursery" sites in brackish water or fish are placed directly into a full saltwater site. During this time, they are held in large cages, and grow quickly. Each cage for the smolt can hold about 50,000 fish. After 6 to 9 months they have reached around 1.5kg, and are then transferred to marine sites for grading and on-growing to harvest size. Once transferred to the grow out site, the fish are held for up to 15 months. A three tonne feed bin is floated at the centre of the cages with a spinner system which can distribute up to two kilos of food per spin to all areas of the cage.They continue to grow rapidly in the cages in the sea water, until they are ready to be harvested. The typical harvest size is between 3kg and 4 kg. 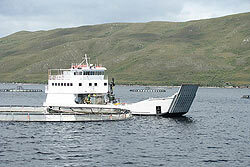 Once harvested, most fish farms again rest the site before using it again. Seals are the major predators of the growing salmon. To prevent the seals from reaching the salmon special predator nets are used. These have two nets, the inner net keeps the salmon in, the outer net is to keep the seals out. 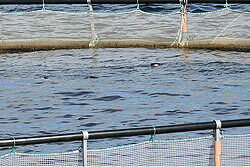 Birds, eating the salmon feed, are kept out by covering the cages with netting. After harvesting the fish are sold either as fresh or frozen product. A large amount of the product is also smoked. 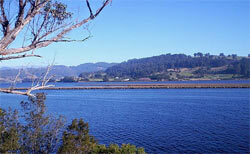 The hatcheries within the Huon Aquaculture Group [HUON] mimic the natural lifecycle of the Salmon. In the wild, the young salmon spend the first year of their lives, in rivers and streams before moving to the sea to feed, grow and return to lay their eggs. The Salmon naturally lay their eggs [spawn] in May of each year. As in the wild HUON salmon start their life as eggs in freshwater. We collect eggs in June/July from females and these are fertilised by male brood fish. The resultant fertilised eggs are then incubated in dark cool water until they hatch, a process that lasts almost 3 months. When they hatch and become known as Alevins. This phase covers the salmons life in brackish and seawater until they are ready for harvest. Once the smolts have been transferred they start out in brackish waters. They weigh around 100 grams and grow very quickly after transfer. The fish will reach market size (4Kg) usually within 14-16 months in seawater. As the fish acclimatise to the salt water and continue their grow phase, they are transferred into larger sea pens and moved progressively further out into the ocean. fter being stunned, the salmon are bleed and placed in an ice slurry ready for transport to our wet processing facility at Port Huon.